Description: Kimber of America KimPro Tac-Mag – Compact size, stainless, 7-round, .45 ACP, interchangeable pads- NEW. 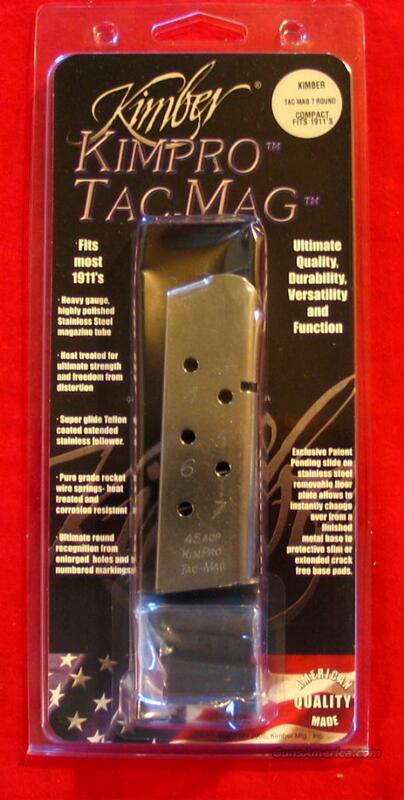 The Kimber KimPro Tac-Mag magazine is the ultimate magazine for 1911 compact (Officers size) pistols. The Magazine is highly polished stainless steel that is heat treated for optimal strength. Super glide Teflon coated extended follower, rocket wire springs and exceptional round recognition from enlarged numbered holes. Removable stainless steel base plates with two supplied slam pads offers three configurations, changeable in seconds. Fits Kimber Compact and Ultra models or any mil-spec Colt Officers size 1911 style pistol. S&H = $7.00 USPS Priorty Mail / $2.00 each additional on same order. To pay on line - go to perkiomengunworks.com - find item - put in your cart and check-out. All transactions will be charged a 3% maintenance fee added after check-out. We will receive notice of your payment automatically. To pay via mail with NO extra fees – email us and follow these directions: To commit to item we need your full name, address and phone #. This will only be used to hold item until your payment arrives. Will confirm back sale if you are the FIRST we hear from with this information.